Right in the heart of one of the largest technology market places in the world , ‘Praise Flame’ comes to berth! 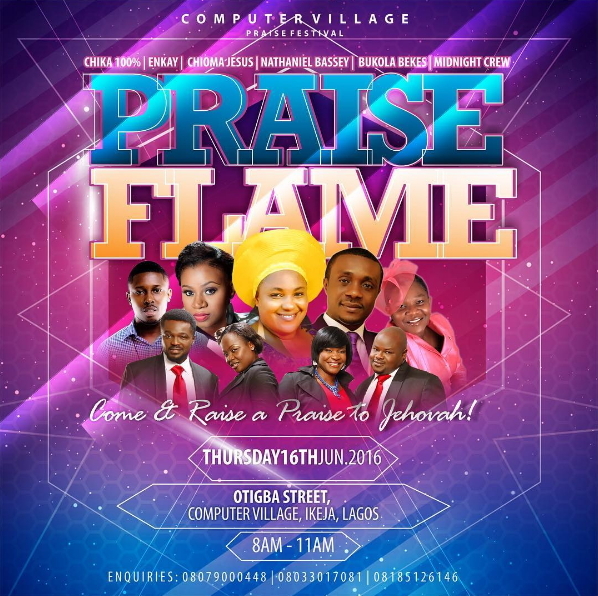 On the 16th of June 2016, the computer village praise festival tagged’ Praise Flame’ is scheduled to take place . The purpose of this nouvelle initiative is to gather phone dealers, users and marketers together in an atmosphere of praise to God. An encounter awaits all those that will be in attendance. Billed to minister at Praise Flame are: Chioma Jesus, Nathaniel Bassey, Midnight Crew, Enkay ,Bukola Bekes andChiika100% all gospel heavy weights with unique mantles of praise and worship. Come and raise praises to Jehovah!